The western bumble bee, Bombus occidentalis. Credit: Stephen Ausmus. Look up the word "bumble," and the definition may read something like "To move or act in a confused, awkward or clumsy manner." But the bumble bee, a member of the genus Bombus, is anything but clumsy. In fact, the insects are expert aviators, alighting with precision inside flowers and vigorously shaking pollen loose from their stamens. 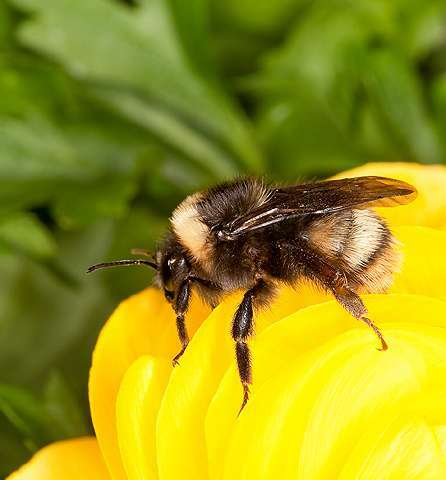 Some bumble bee species are pollinating professionals on par with honey bees. At the Agricultural Research Service's (ARS) Pollinating Insect-Biology, Management, Systematics Research Unit in Logan, Utah, scientists are conducting multi-faceted studies on Bombus species of all shapes, sizes and colors to ensure their wellbeing and usefulness to agriculture—especially in pollinating greenhouse-grown plants, primarily tomatoes. 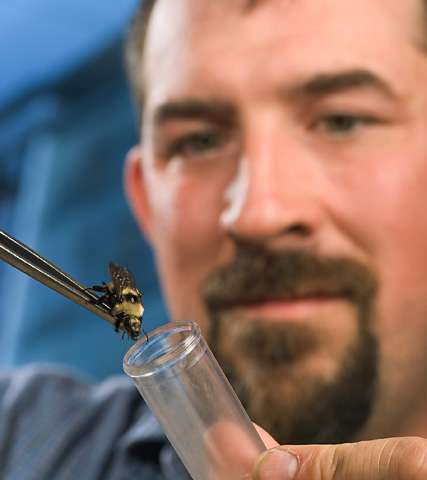 One project, the USBombus database, actually arose out of concern over the national decline of four Bombus species—including the western bumble bee, Bombus occidentalis, which had been reared commercially up until the early 2000s, notes James Strange, an ARS entomologist in Logan. USBombus—the largest database of a contemporary North American bumble bee survey—was created in 2010, following a three-year effort by Strange and other ARS and university scientists to assess the abundance and distribution of wild Bombus populations across a wide range of habitats. These included urban, agricultural and natural environments, such as alpine forests and prairies. Housed at the Logan lab as part of the U.S. National Pollinating Insects Collection, the database originally stored information on 17,930 adult bumble bee specimens collected from 41 states and representing 39 total Bombus species. That number has expanded to over 80,000 specimens and counting, as more historic and current collections are added, notes Strange. Some of the latest specimens include a few he collected and identified this past May while he was participating in Centennial Bioblitz events hosted by the U.S. National Park Service at the North Cascades and Olympic national parks in Washington State. USBombus and the National Pollinating Insect Database, which includes specimens dating back to the 1800s, can be accessed on the Internet via the Global Biodiversity Information Facility website at http://www.gbif.org/.